Kiko Milano's Long-lasting fluid foundation ensures perfect makeup all day long*. The formula's active ingredients are rich with properties: the sea lavender extract gives the skin a lift while the blend of exotic oils helps hydrate and nourish the skin without being heavy.The light foundation has a velvety smooth texture that's a breeze to apply and adjust. It provides medium-high coverage and contains sunscreen which helps protect the skin from the first signs of aging.Unlimited Foundation SPF 15 comes in fourteen shades, one for every skin type and complexion. Your makeup will always looks perfect. *Self-evaluation test of a multi-ethnic sample of 100 women. 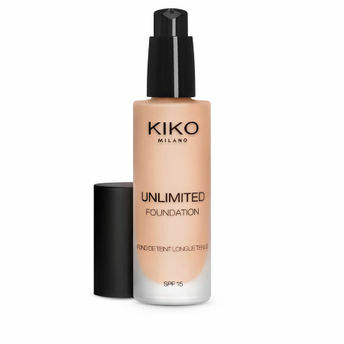 Alternatively, you can also find many more products from the Kiko Milano Unlimited Foundation range.